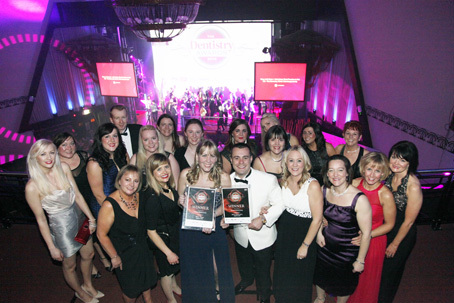 At last years Dentistry Awards, Thorpe Dental Group were winners again and Awarded Best Team North East. In 2015 Mark Pugson, one of our dentists at our Woodthorpe site was nominated and won the Making a Difference Award through Healthwatch York. Healthwatch York is part if Healthwatch England who are the National Consumer Champion in Healthcare. They have a feedback Centre on their website which allows members of the public to pass on comments about the care they have received from Health and Social Care services within York. In the Dental Awards 2014, Dr Kris Leeson was a finalist for Young Dentist of the Year, and Thorpe Dental Group were finalists for Team of the Year-North. The Dental Awards is the UK’s premier annual awards scheme, developed to recognise and reward the very highest standards in UK dentistry & oral healthcare. At the Private Dentistry Awards 2014, Dr Kris Leeson and Thorpe Dental Group were finalists in the Best Employer category. We also had finalists for Best Team of more than 20 employees and Best Charity or Community Project. Thorpe Dental Group won Best Team and Best Practice North East. Dr Kris Leeson was also shortlisted for Best Young Dentist North East, and our Practice Manager, Mechelle Derbyshire was shortlisted for Most Outstanding Individual North East. 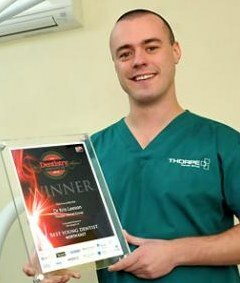 The finalists for The Dental Awards 2012 have been announced and Dr Kris Leeson our principle dentist/Thorpe Dental Group York owner has been shortlisted for the Best Young Dentist North East Catogory along with three others. The prestigious event, awards ceremony will be held on the 7th December at the stunning art deco cinema Athena, Leicester. The 2012 awards are set to be more glamorous and more magical than ever before. This is an enormous accomplishment for the Kris and his teams at Thorpe Dental Group wish him good luck and will be there on the night to support him. UPDATE – Dr Kris Leeson Winner Of The Dentistry Awards Best Young Dentist North East 2012.